London’s Brick Lane has a fascinating history and is one of the most popular places to visit in the East End today, especially on a Sunday when the street’s gets the area buzzing. Sitting in the heart of the East End, Brick Lane was a poor slum area in the past; it was in the very heart of Jack the Ripper territory. Today, following a bit of regeneration, it offers exciting alternative shopping opportunities, various markets and some of the best curries in the capital! 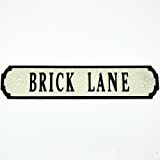 Brick Lane runs from Bethnal Green and through Spitalfields down towards Whitechapel. The street was originally called Whitechapel Lane; it is thought that it was renamed because local earth was used by brick and tile manufacturers who set up shop in the street in the 15th century. By the 17th century, the street had also become a popular location for breweries. The famous brewing family, the Trumans, started their business here and you can still see their Black Eagle Brewery on the street. This century also saw the start of its market. Its proximity to Spitalfields saw an influx of French Huguenots when they were driven out of France, also in the 17th century. The street and the surrounding area became well known for its weaving and tailoring. Like much of the East End, this area was a haven for immigrants moving into London to escape persecution abroad or looking for a better life. During the 19th and 20th centuries, it was best known for its Irish and Jewish population. The community living in and around Brick Lane today is predominantly Bangladeshi. This gave the area a new nickname and a new cuisine! 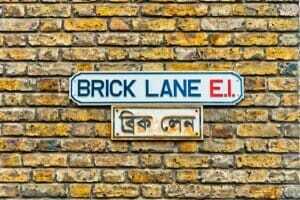 Brick Lane is often fondly called Banglatown by Londoners. Since the late 20th century, this has been one of the most popular places for immigrants from Bangladesh, particularly Bengalis from the Sylheti region. The street is THE place to go for a curry in London, especially if you want to try traditional and authentic cooking rather than run-of-the-mill high street curries. The many different cafes and restaurants in the area originally started to service the local population or those passing through London via its docks; it is now the capital’s most concentrated area of curry houses. Some are quite upmarket; others are quite basic. You do have to try to avoid mainstream restaurants that have started in the area to tap into its popularity, but there are still plenty of gems around. Bear in mind that you may not be able to drink in some Brick Lane curry houses if they are run by Muslims; in others, you may have to bring your own bottle if you do want to drink alcohol. Brick Lane is quite a trendy area at the moment, and you do have other options for food if you don’t fancy a curry. There are still traditional Jewish bagel shops dotted around and various cafes and stalls selling anything from a traditional full English breakfast through to exotic Japanese takeaways. 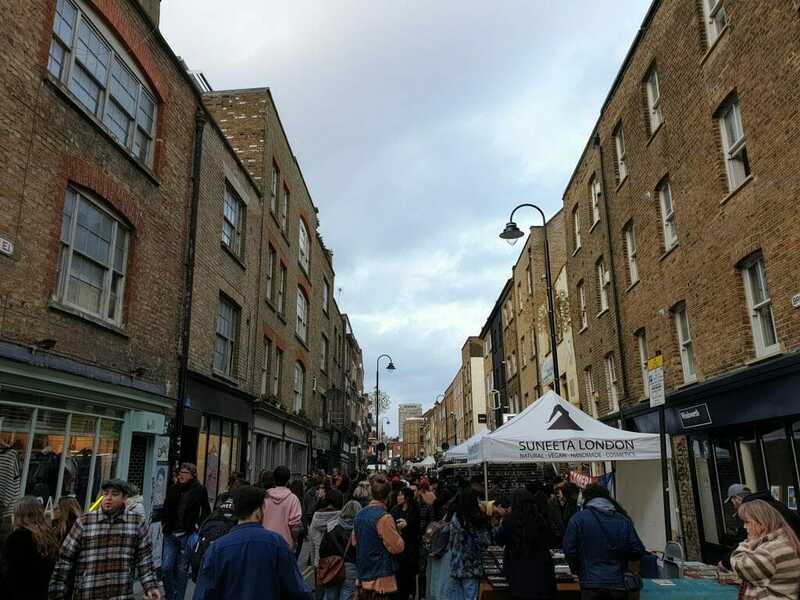 Brick Lane has an extremely popular and quite eclectic Sunday market that is popular with locals, Londoners from other areas and visitors to the capital. The market was originally licensed to run on Sundays in the 1800s – this was unusual at the time as markets were not supposed to open on the Sabbath. At that point in Brick Lane’s history, the local population was predominantly Jewish, so a special dispensation was given for Sunday opening, as the Jewish Sabbath falls on a Saturday. A Sunday trip to Brick Lane market is generally a lot of fun. You may find some regular stalls in there, selling the kind of stuff you’d expect in a market, but the real charm here are the second-hand stalls. People sell all kinds of stuff at Brick Lane – you can pick up collectibles, CDs/DVDs, vintage clothes, retro accessories and even large pieces of furniture – and it is still possible to hunt out a real bargain or simply buy something a little bit unusual. There is also usually some street entertainment going on throughout the market site and you can also pop into various indoor markets, such as Upmarket and Backyard, which operate out of the The Old Truman Brewery building. This complex also contains galleries, exhibition spaces, shops, and bars, restaurants and cafes. Brick Lane is also home to a thriving artistic community. 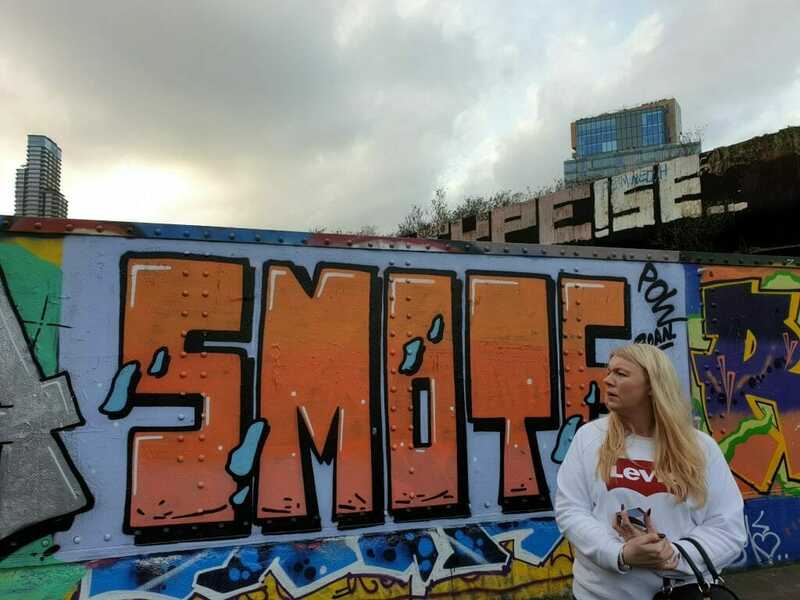 Its graffiti is particularly worth looking out for – street art is celebrated here rather than immediately cleaned off! Lucky locals in the past have seen work spring up on their walls from C215, Stik and ROA. There are also plenty of small galleries dotted around Brick Lane and its surrounding streets that are well worth a visit. I am researching The Two Brewers pub at the corner of Brick Lane and Buxton Street. I had ancestors running it between 1805 and 1840s. If anyone has any stories of drinking there it would be good to hear. It is now a clothes shop called ‘Religion’. Just seen these posts and brings back memories. My parents ran the Crown and Shuttle, in Shoreditch High Street, in the early 1960’s. Remember Brick Lane very well. Used to go to the Trumans Brewery with Dad, pub was a Trumans House. Also remember going to Kelly’s Pie and Mash in Bethnal Green Road, to pick up a bowl of Jellied Eels for the pub. My brother and I used to walk over to Club Row market on a Sunday morning to look at the animals for sale. Haven’t been back for a while, but will do when I get more time. hello! my great grandad owned a chocolate store called Friedman’s on Brick Lane in London. does anyone know anything? photos? anything at all would be so helpful. thank you so much! Trying to find out some information about a fishmongers on 8-10 Brick Lane in the 1880’s owned by a Jewish man named George Rush. Literally anywhere else in the country will do a better curry than most places on Brick Lane, though I don’t doubt somewhere amongst the dozens of curry restaurants there will be one hidden that actually does good quality food. That said these days Brick Lane is good for vegan restaurants that actually do nice food. I grew up in Flower & Dean street off of Brick Lane 1559 – 1970. I lived in a late Victorian tenement block called Ruth house (Demolished) I remember Brick Lane when most of the shops were Jewish and what is now a mosque was a synagogue. I remember going to see Mary Poppins in the Brick lane cinema (gone) I can still smell the roasted malt from Trumans brewery which one could smell a mile away. It was a tough east End Ghetto but community was thriving and there was strong neighborly bonds. For a child growing up there, every day was a new adventure. We had no computer games, no mobiles (No one had a house telephone) and very little TV; but we were never bored. I have so many memories etched on to the canvas of my mind. I don’t want to bore you dear reader so I will stop here with the hope that will inspire some to a sense of local history, your’s and mine. Hello John, please feel free to share your stories. Many of us here really enjoy reading about life in the East End. I was born in 1971 so for me the East End was in transition. Still plenty of bomb sites and dereliction in the docks bit also the plans were afoot for new roads etc. Happy New Year. I had moved to Bow by 1971. Lefevre walk was brand new then. I remember fighting with my brother when we first moved there, for who would have the first bath, as we never had a bathroom in Flower and Dean street, only a tin bath, so most of the time we would go to the local swimming pool, at least twice a week- In 1968/9 it cost sixpence in old money which is 2.5 New Pence. Lefevre walk was demolished about 30 years later,it was a disaster in social housing design. John, your’s are the sort of comments I enjoy reading – time past and what life was like in specific areas of London “back then” and not only London, but all of England. I have absolutely no interest in modern life anywhere, specifically London, also New York City, where I live. My interests lie in the lives lived in the past. I hope to read more of your reminiscences! Thank you! Thanks for you nice reply. Happy New year. Growing up in East London for me was a very positive experience. Dare I say character building. I knew all the local vagrants by name and they knew mine although mum would scold me for talking to them. I remember my friends and I would often visit Blooms, a then Famous Kosher restaurant, well, the rear kitchens; the chef would give us a large tray of Latkes and chips just to get rid of us, ( I can still taste those delicious Latkes}. kids today have relationships with their Smart-phones,TV and computer we built relationships with each other, the local shopkeepers, the local bobby(who walked amongst our community), the local vagrants, the Local parish priest, the park keepers and the market workers. We learnt to communicate face to face with all sorts of people. I will stop there for now Barbara. Hello John, my Grandparents lived in Bacon Street with my Uncle and Aunt. Would you know anything about the fire in their Tenement which killed my Grandfather and Uncle. This was about February 1945. They survived all the bombing and then this happened. I still remember Brick Lane and its brewery smells as it was then. This article is so off base. I’ve lived around brick lane for years and never heard anyone call it Banglatown. And the curry restaurants are appalling. They rip you off. They ran on a few years of reputation but started scamming on quality or watering down wine thinking people wouldn’t care. Now they are thankfully shutting down and better more diverse stuff is moving in. Brick lane is loosing its reputation as a curry capital. few reasons behind it. poor hygiene, low quality food , adding service service which is not mention at the menu. get aggressive with customer and sometime physically attacks. mostly people who stand outside the reasturent for bringing the customer in by offering false offers. there were few good place to eat but not any more. they had to shut down for sales drop and high rent in this area. Looking for a bit of help here…..my father is shown on his marriage certificate as living at 19 Brick Lane just before the ceremony. On the Electoral Register for 1930 he is listed as one of 147 (!) men living at that address.Any idea what sort of institution was at that address? I just did a random check of 1925 and 1940 London telephone directories, 19 Brick Lane is listed as a common lodging house. No it’s not. Banglatown was a ridiculous title dreamed up by the council and shunned by everyone else. “The street is THE place to go for a curry in London.” No one in their right minds would go for a curry on Brick Lane. The food is despicable and aimed at drunk city workers and tourists. curry fans go to Tayaab’s on Fieldgate Street and similar.